You may remember that we put up a blog post last month on Canadian publishing in 2017, where we reported some stats pulled from our sales tracking service, BNC SalesData. But did you know that we also do consumer surveying where we ask Canadian book buyers questions that can't be answered by SalesData? Some of the questions we asked of book buyers involved the formats of the books they purchased, whether they do their book shopping online or off, and whether they belong to a book loyalty program. Here are the results. While the above graph shows some fluctuation, quarter to quarter, from 2015 to the end of 2017, we can see that audiobook purchases in the Canadian market have remained fairly flat, from a yearly average of 2.6% in 2016 to 2.3% in 2017. Hardcovers also remained pretty flat year over year, despite the upward trend you can see from the first quarter of 2017 to the last quarter; looking at the yearly average, they made up 24.8% of book purchases in 2017, up slightly from 23.9% of purchases in 2016. Paperbacks and ebooks show the most movement. 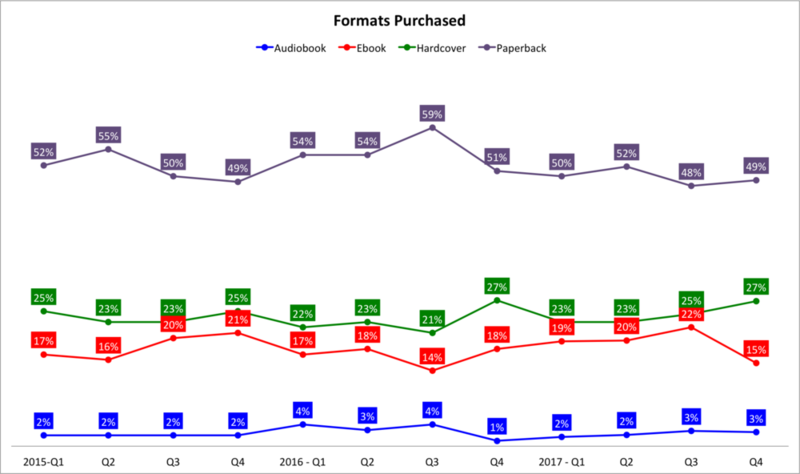 Paperbacks continue to make up the lion's share of book purchases, at 49.8% of purchases in 2017, but this is down slightly from 54.2% in 2016. While ebook purchases saw a sharp decline in the fourth quarter of 2017, the yearly average for 2017, 18.6%, was up over 2016 when the average was 16.9% of purchases. While there is no definitive connection that shows ebooks are up at the expense of paperbacks, it's possible that there's a correlation, perhaps due to fluctuations in pricing. Now that we know which formats book buyers prefer, let's take a look at where they're buying their books. Overall, the online market is up since 2015 while physical channels have seen a decline. Online channels (which include websites, mobile apps, and ebook/audio retailers) accounted for 46.2% of purchases in 2015, 48.0% in 2016, and 51.6% in 2017. Physical channels (which include bookstore chains, indie bookstores, general retailers, discount stores, book clubs, and grocery stores) saw a corresponding decline. These channels accounted for 53.7% of purchases in 2015, 52.0% in 2016, and 48.5% in 2017. For the first time in our quarterly consumer surveying, we asked book buyers whether they belonged to a book loyalty program (for example, Indigo Plum Rewards, Indigo iRewards, Amazon Prime, Kobo Super Points, or local bookseller loyalty programs) and 58% of them said they do. Want more information? The 2017 edition of our comprehensive study on print sales in the Canadian market, The Canadian Book Market 2017, will be out later this winter, and we have lots of consumer studies available that dive into our survey results on book-buying and reading behaviour.